This week we feature a photograph taken of a racer, by a racer: Biplane Racer, Jeff Lo ("Miss Diane") captures Ocala, Florida, resident, Jimmy Leeward passing home pylon at the 2002 National Championship Air Races in his nearly "stock" North American P-51, "Cloud Dancer". On the list of all-time Air Race fan favorites, Jimmy Leeward would surely rank near the top. 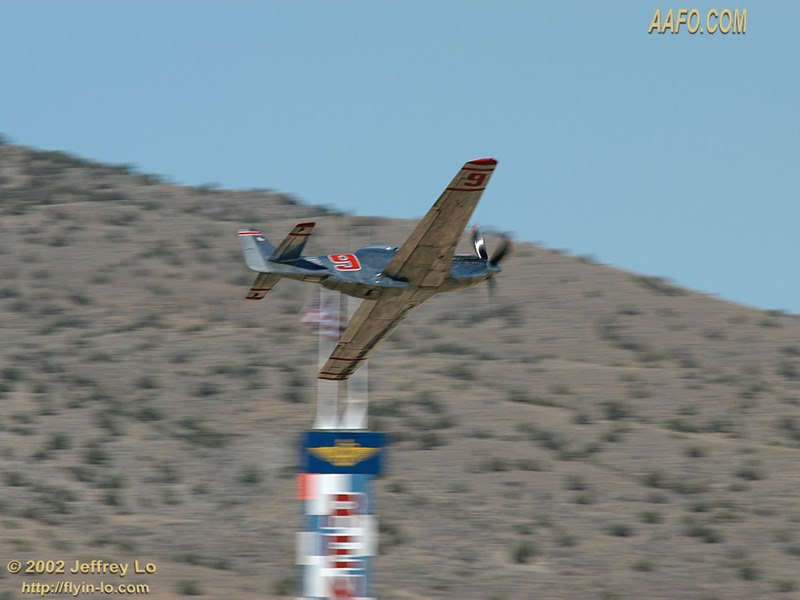 From nearly the beginning of the current era of Air Racing, Leeward has graced the very competitive skies in everything from his P-51 "Cloud Dancer", to his super sleek modified P-51, "Specter/Leeward Air Ranch Special", his immaculate MiG-17, to the L-39 "Firecat" that he raced in the inaugural "Jet Class" race at Reno 2002 and nearly everything in-between! Jimmy has not raced his "other" plane, affectionately known by most veteran Air Race fans as "LARS" (Leeward Air Ranch Special) an airplane with a very colorful Air Racing history (formerly Cleveland era racer "Galloping Ghost") in several years but he has high hopes of securing sufficient sponsorship to return the airplane to competition in the near future. For more information on "Jimmy Leeward And His Airplanes", read this 2000 feature. For usage rights or prints of this photo and others by this photographer, click name below. This website is free for all to visit and enjoy. We are aided, in part, by modest sponsor contributions, but mostly, this website is the product of much hard work and loving effort by those who contribute their time and personal funds to bring the stories herein to our readers. If you would like to help us continue to generate high quality and diverse coverage of various aviation subjects, your contribution would be accepted and greatly appreciated. We will never be a subscription only publication and we will resist at all costs the placement of non-relevant and annoying advertisements. However, for us to continue this effort at the level we currently have the privilege of providing our readers, we need the help of those who visit and enjoy this web based aviation publication. Thank you for your support, if you wish to help CLICK HERE to contribute. When new Photo Gallery sections are added, or something special in the world of Aviation and Air Racing is taking place, we will feature a special photo feature presentation within this window. Watch for more Air Race photography as the weeks move on towards Reno 2001. AAFO.COM presents the finest moments in Aviation and Air Racing past and present. copyright �1997-2002 Airport Fence Productions, Inc.
are the exclusive property of Airport Fence Productions, Inc.
Use of this material is strictly forbidden without prior consent. Have a favorite shot you'd like to see on this page? Instructions for wallpaper use: Click on image and size of your choice. "set as wallpaper" from the option menu.